"DesktopMates characters are not stand alone products which can run by themselves and requires Microsoft Agent Technologies to be installed on your computer as well as a program to load and operate them, such as CyberBuddy or Ultra Hal." 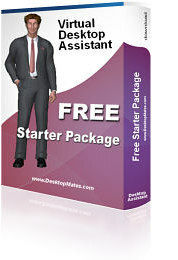 This page contains downloads and packages to help you get everything you need to get up and running, including a free full version of one of our DesktopMates characters so you can completely test this technology to make sure everything functions properly on your system before deciding to purchase any of our character models. Make sure to completely read and follow all the instructions and steps provided on this page as well as in the packages that you download. NOTE: This page only provides instructions to assist you in installing the required components and get you successfully up and running. Advanced functions and settings are provided in the programs used to operate the characters, such as CyberBuddy or the Ultra Hal Artificial Intelligence programs. These technologies don't simply pop up a character onto your desktop which proceeds to mindlessly entertain you, it's much more sophisticated than that, these programs provide and add functionality to the characters, such as doing tasks for you and/or providing user interaction, so be sure to carefully READ THE HELP sections included in these programs. 2. Double Agent (basic MS Agent components including the folder in which characters are installed and loaded from. 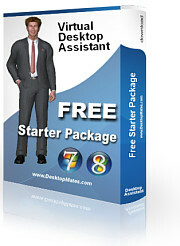 If you're new to DesktopMates and MS Agent Technologies download our New User Starter Package. Includes everything you need to get up and running. All software and components in the package are totally free with no trials or timed out versions. No Adware or Spyware! - Help File with complete easy to follow instructions for installation as well as troubleshooting and fixing common issues. Click the box to download! For Windows 7/8/10 and 64bit systems see packages below. CyberBuddy has released a version compatible with 32 and 64 bit Windows 7 operating systems (and beyond). - Keep reminders and get your attention when a reminder is due. - Bring you the latest Headlines, in several news categories. - Give you the local Weather. - Tell you the time at designated intervals. - Get Stock Quotes - Reports when changes under/over limits. - Read text, web pages, documents or the clipboard to you. - Remember to give you a compliment, and much more! Note: The FREE version of CyberBuddy is fully functional with the exceptions of Speech Recognition and the Agent Viewer options which are only available in the premium version of CyberBuddy. If you're already using Double Agent with Windows 7 or beyond, you MUST first uninstall Double Agent prior to installing CyberBuddy and then reinstall Double Agent again in order for Double Agent to function properly. 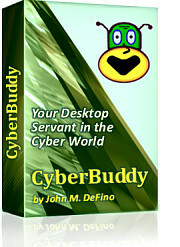 Once you have downloaded the CyberBuddy program return here and download this starter package for Windows 7/8/10 (32 and 64 bit systems supported). 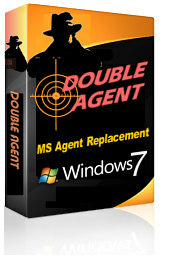 - Double Agent program required to run MS Agent programs on Windows 7/8. *If you installed the MS Agent components on Windows using Microsoft's Hotfix or by installing CyberBuddy, character transparency will not be supported and you will see a colored box behind the character. To avoid this you should install and use Double Agent instead. Microsoft has discontinued support of their MS Agent technology and the components are not part of Windows 7 and beyond. Double Agent is a replacement for the MS Agent components that are required for DesktopMates and other Agent based applications to function on Windows 7/8/10 and beyond. - Supports background transparency for DesktopMates and other MS Agent based characters. - Versions for both 32–bit and 64–bit systems included. - Includes Help File with installation instructions. After installing Double Agent you may need to set your system to use Double Agent. Go to your system's Control Panel and then locate and open Double Agent. In the dialog, click the "Emulation" tab and then click "Use Double Agent". If you plan on using CyberBuddy it's recomended that you first install CyberBuddy prior to installing Double Agent. If you're already using or installed Double Agent you MUST first uninstall Double Agent prior to installing CyberBuddy and then reinstall Double Agent again in order for Double Agent to be able to function properly. This is required because CyberBuddy installs the original default Microsoft Agent components used by Windows XP and Vista. Windows 7 and beyond users will need to overide the default Microsoft Agent components and utilize Double Agent instead. Which is accomplished by going to your system's Control Panel and locating and opening Double Agent. In the dialog, click the "Emulation" tab and then click "Use Double Agent". Try the Ultra Hal Artificial Intelligence Program and Conversational System to run your DesktopMates characters. Try before you buy (30 day free trial), if you wish to continue using Ultra Hal after the trial period you can purchase it for $29.95 using the link provided in the program. Compatible with Windows XP/Vista/7/8/10 ... 32 and 64 bit supported. Although it's not really required, we would also recommend that you download and install the Free Character Plugin for Ultra Hal available on our site, it will make the character appear to load more seamless with Ultra Hal. Commercial grade AT&T voices are also available. Be sure to check out AT&T's Audrey British English voice, this is arguably one of the most unique and expressive sounding computer generated voices available.